Comics #1 thrilling cover and incorporates both colour and engraving. This 35g fine silver collectible is presented in a sturdy acrylic holder, designed to frame the foil and allow for easy display. The foil and holder come packaged inside a complementary themed carrier. 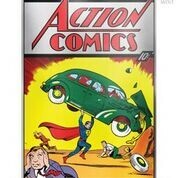 •Pure silver foil features a replica of the Action Comics #1 cover from June 1938, featuring the first appearance of Superman. 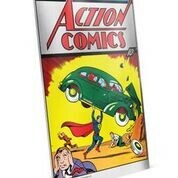 •Considered the beginning of the superhero genre and the most valuable comic book of all time. Original copies are almost unobtainable. •Unique design incorporates both colour and engraving. •Officially licensed by DC Comics. •Packaged in innovative acrylic cover for easy display and themed outer carrier. 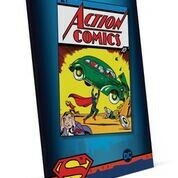 •Great present for any fan of DC Comics, superheroes and Superman.